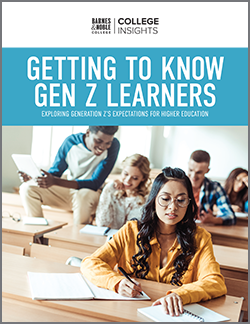 If by some miraculous chance, they’re not familiar with him yet, the students who recently returned to Tufts University will soon come to know the oldest inhabitant of the campus. In the university setting, where mascots are a fundamental part of college life, Jumbo the Elephant has been ranked among the most singular mascot in college athletics by The Sporting News and Sports Illustrated, and is the only college mascot to be found in Webster’s Dictionary. This year, Tufts will be commemorating the 125th anniversary of the larger-than-life mascot — and the university’s bookstore has created some unique ways to celebrate him. Barnes & Noble College has enjoyed a 32-year partnership with Tufts University, managing its campus bookstore and today, Bookstore Manager Boon Teo heads an experienced team of professionals who have themselves shared a long history with the Boston-area school. Carolyn LaQuaglia, a Tufts alumna and former store manager for six years, started at the store as a student cashier thirteen years ago. 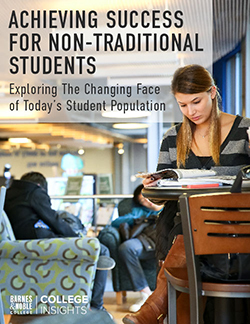 “We’ve seen the role of the campus bookstore evolve over the years,” she explains, “and because of that, we have also understood how important a beloved icon like Jumbo is to this school and to its history,” she adds. 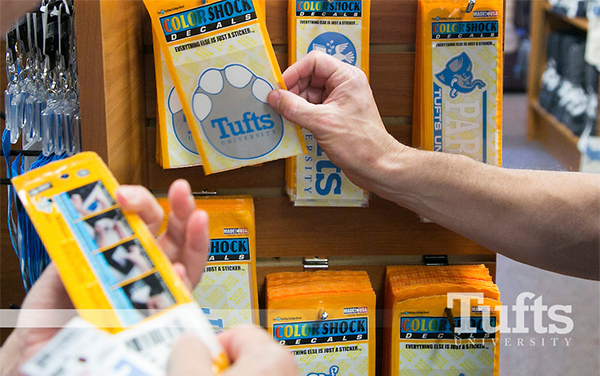 Examples of some of the Jumbo the Elephant merchandise sold in the Tufts University Bookstore. The mascot’s 125th anniversary coincides with a renewed movement on campus to boost school spirit and support larger attendance at the university’s various sporting events. “It’s provided us with the perfect opportunity to step up our merchandise efforts and create the kinds of memorabilia the university wants to really celebrate Jumbo’s legacy on campus,” remarks Jenna Scinicarello, Assistant Store Manager. Not surprisingly, for such a legacy, Jumbo himself is not quite the same elephant as he was 125 years ago. 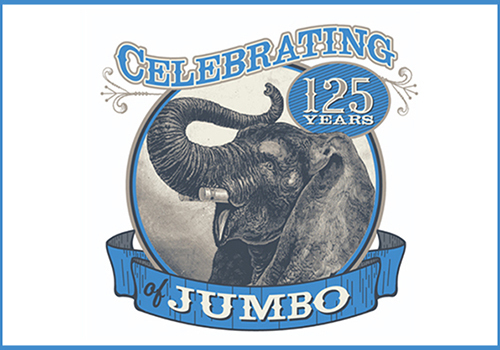 Over the years his appearance has changed, and LaQuaglia notes that even the NFL had a hand in redesigning the various representations of Jumbo the store has used in its college merchandise. “Although we wanted to help promote Jumbo and develop sales, we wanted to do it in keeping with Jumbo’s importance and relevance,” she adds. 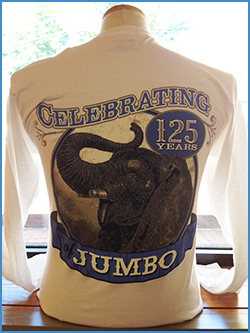 An example of one of the t-shirts offered in the Tufts University Bookstore to mark the 125 anniversary of the school’s beloved mascot. Working with sports apparel vendor, Champion, the bookstore team designed an array of Jumbo treatments for the school’s various activities. “We went through all of the different sports teams on campus, one by one. You’ll find Jumbo in a football helmet or with a lacrosse stick — we’ve put him on just about everything,” Scinicarello explains. That momentum has also spread from the sports field to the various Tufts academic disciplines as well. “We have depicted Jumbo as an engineer — with glasses and a pencil in his shirt pocket — and there’s even an International Relations Jumbo,” she adds. The loveable elephant also has a following with a much younger crowd, and through its College Kids program, the bookstore designed a baby Jumbo, with bow ties for boys or bows for girls. The bookstore also took inspiration from vintage pen-and-ink renderings, and old posters and advertisements that were used during Jumbo’s Barnum and Bailey heyday, from the campus art gallery. Times have changed since Jumbo the Elephant first ‘step foot’ on campus, but some things remain the same. For Teo, who recently took over the management of the bookstore, a new influx of students will bring a familiar demand for textbooks and school supplies — and new merchandise to show their school pride. The bookstore’s efforts to keep the spirit of Jumbo alive are another example of the hyper-local impact the store can have on a campus community and its identity. After all, when you have a mascot as large and as adored as an elephant, you can’t plan anything small.